Billie Fleming is no ordinary lady. 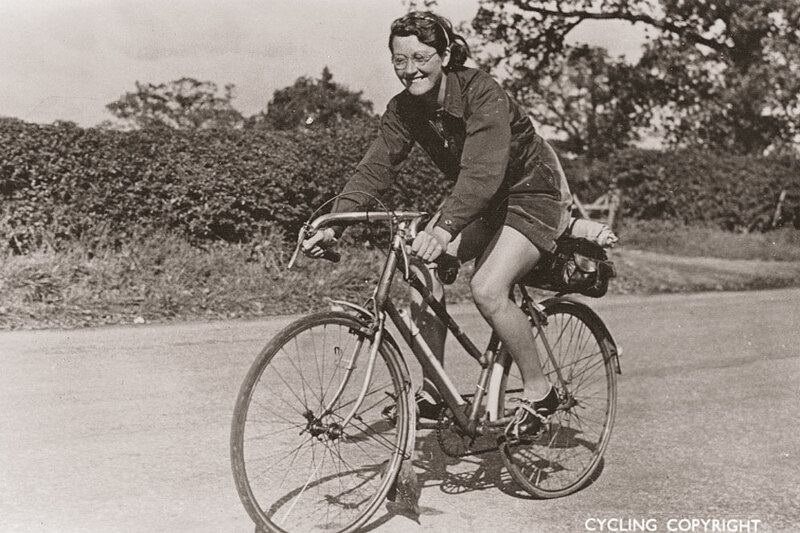 In 1938, then named Billie Dovey, she rode a staggering 29,603.7 miles across the United Kingdom on a mission to promote the health benefits of cycling. She rode every single day of the year in a wide variety of weather conditions to spread the message. Her mammoth tour included many evening engagements that required her to give a talk at the end of a long day’s pedalling. Fleming’s ride attracted a huge amount of interest and press attention as the year progressed. Her huge mileage set a women’s record, and garnered her attention internationally, too. In 1942, Pat Hawkins set out to take the record from Fleming. But although Hawkins’s end of year total mileage was almost double Fleming’s, at 54,402.8 miles, it was discredited after the Australian cycling authorities scrutinised her logbooks. Billie later married George Fleming, also a cyclist with a huge racing pedigree who took on and smashed a number of cycling records himself. 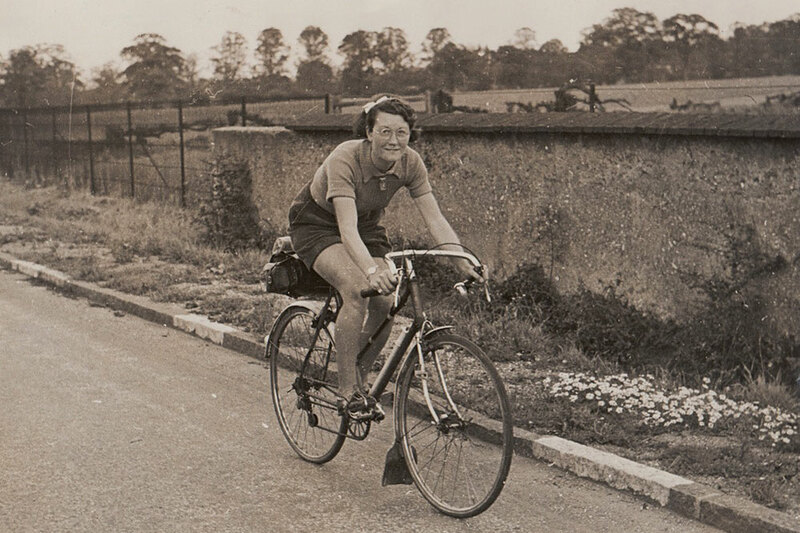 Today, Fleming’s mission to promote cycling’s healthy benefits still bears fruit, and last month she celebrated her 100th birthday at a retirement home in North Devon. Dave Barter paid her a visit to hear her story. What got you into cycling? 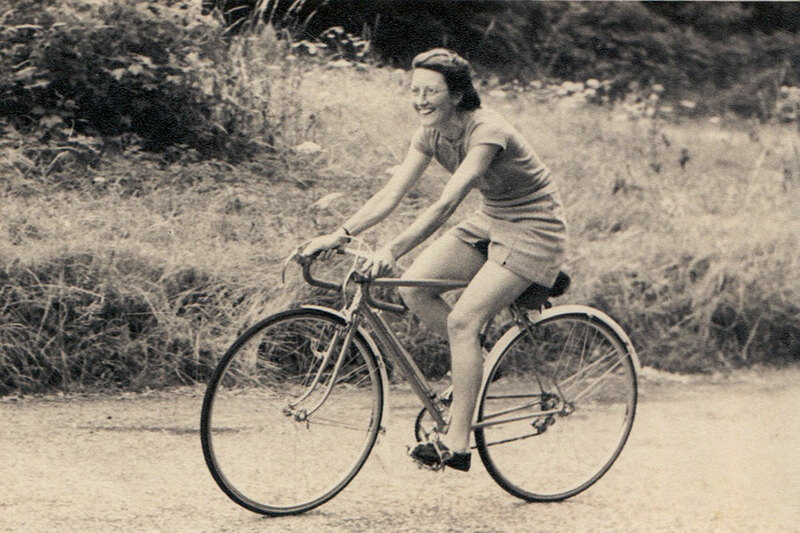 Billie Fleming: I just met a boy who rode a bike; he introduced me to it. I guess I was 18 years old at the time, I couldn’t ride a bike, I’d never been on a bike before. He used to take me onto the Barnet Bypass in Mill Hill, London, in the evening and teach me how to ride this bike. He used to ride about a metre out from the kerb and I had to stay in the gap. How did this lead you to the record? BF: It was just an idea I had, I didn’t set out to attempt a year record. At the time there was a lot of publicity about the Women’s League of Health and Beauty [an organisation concerned with women’s health and fitness]. I was so besotted with cycling that I thought, “Well, you could keep fit by riding a bicycle.” I had this idea that I could do just that. BF: I wrote to several companies and Rudge-Whitworth responded. They provided me with a bicycle and the necessary sponsorship so that I could set out to ride my bike every day for a year. BF: Part of the set-up was sponsorship by Cadbury. I appeared in a number of their adverts and they sent me five pound slabs of chocolate every month. BF: I set out on January 1, 1938 with the promise to my sponsors that I would ride the bicycle every day for a whole year. I managed this despite the harsh winter in December 1938, when it snowed. Instead of taking myself down to the West Country, where it wasn’t snowing at the time, I scratched around the snowy roads of London for a few hours instead. I was fortunate in 1938 as it was a lovely summer, however. BF: I set out from Mill Hill in London, out towards Hatfield and Stevenage as a round trip. When I changed my direction I had to complete a cycling checking card and send it back to Mr England at Cycling magazine [now Cycling Weekly]. Tell us about the checking cards? BF: Often I’d complete two or three a day, and get them signed by witnesses. I had a cyclometer on the bike and had to go to the Cycling offices in Bowling Green Lane in London for them to check that it was sealed and not tampered with. Cycling magazine came out to follow me one day and strangely enough I had a puncture, the only puncture I had in the entire year. Describe your average day in the saddle. BF: I’d ride during the day and in the evening I would often go to a cycle shop. I also had to call in on Rudge-Whitworth cycle dealers and have a discussion with them about the ride. It must have been a long day for you? BF: Yes, but I was young and fit and ready to take on anything. Describe the bike and equipment you were using? BF: It was a Rudge-Whitworth fitted with a three-speed cycle derailleur gear. You don’t want more than three gears, do you? BF: You can’t tell the difference between them. Three is plenty, 33 is ridiculous. The Rudge-Whitworth was a great bike. I found it really comfortable to ride, even on long 100-mile-plus days. How were the roads in 1938? BF: There was less traffic, of course. Other than that, well, roads are roads! In fairness, the road surfaces were similar to those encountered today, but the lack of traffic made cycling a lovely experience. How far were you riding each day? BF: My average was about 81 miles per day, but in the summer I rode further in the better weather and longer days. One day I was in York, woke up in the morning and said to myself, “I think I’ll ride home today,” and set off back to Mill Hill. I ended up riding 196 miles. I loved it. How did you manage for food and water during your record? Did a crew support you? BF: I was completely self-supported throughout the record and used to go into cafes or shops to get some food. I didn’t carry any water with me at all; just a saddle bag with some clothes and tools. What was your final mileage figure? BF: 29,604 miles for the year. I don’t think it has been beaten since. An Australian lady, Pat Hawkins, made an attempt in the 1940s but her record was disqualified for [irregularities]. I didn’t ever meet her. Was there an event at the end? BF: I finished at the Agricultural/Horticultural Hall and they had a reception there for me. Mr England was there along with the cycling journalist community. BF: I was planning to ride across America but the war came and those plans were cast aside. Tell us about your husband, George Fleming? BF: I met him quite a while after the war. My first marriage broke up and meeting George was a turning point in my life. He was just the most wonderful person and also an amazing cyclist. He was a really talented racer and the first to do 50 miles in under two hours. He did this ride on the famous Bath Road course. Did you meet any of the other mileage record holders? BF: Yes, I met René Menzies [French long distance cyclist], he was quite a character, and I also met Tommy Godwin [the men’s year mileage record breaker] in 1940. How would you describe Tommy Godwin? BF: Well, someone who liked riding his bike! He was a no-nonsense, hardened rider. Not a chatty man. Have you kept an interest in cycling over the years? BF: Oh yes! The last big thing I did on my bike was in 1957. George and I went to the Pyrenees and cycled over the whole mountain range from the Atlantic Ocean to the Mediterranean Sea, including all of the classic mountain passes. The Col du Tourmalet was my favourite. You never think you’re going to reach the top. We spent two weeks in the mountains and finished with a week’s holiday by the sea. Are you still interested in cycling? BF: Yes, I watch the Tour de France and other events. How would you compare cycling today with 1938? BF: I find it hard to compare the two. I think modern cyclists have a harder time than we did due to the traffic on the roads. More people were riding to work in those days, but I think it’s starting a bit more in London now with people commuting. I wouldn’t want to ride there though. Where did you like riding the most/least? BF: There weren’t any worst ones; everywhere was interesting because you have a bike and you could discover things. My greatest discovery was possibly Yorkshire and the countryside there, over Sutton Bank. I’m looking forward to seeing the Tour there in 2014. How far afield did you go during your year? BF: I got as far as Loch Lomond in Scotland. One evening the Glasgow Wheelers invited me to their club run and we went out for a ride. On the way back from the cafe we were coming down a long hill into Glasgow, I was in with the group, and didn’t see a pile of grit. I rode straight into it and fell down within this group of men. I felt a right twerp. Do you think your campaign to promote the healthy benefits of cycling worked? Did you get a lot of attention? BF: It’s hard for me to say. People were very enthusiastic about my ride and people would often come and see me in the evening when I gave a talk at a shop or village hall. I’d tell them how nice it was to ride a bike; it keeps you fit and doesn’t make any noise! What advice would you offer to anybody planning to take on a challenge like your record today? BF: The only thing I could say to that is that you have to really want to do it. Whatever the weather is that morning, you have to put your clothes on and get on and ride the bike. It’s not funny walking out in the pouring rain and getting on your bike. You have to hold the determination to want to do it. You will have bad days, but the good days make up for all of the bad ones.